Scoliosis is a condition that appears as a curvature of the spine. 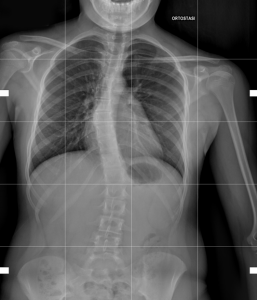 A spine affected by scoliosis may have lateral or side-by-side curvatures that measure 10 degree or more, according to The Scoliosis Research Society. The curvatures may be on one side of the spine (right or left) or on both sides and in different sections (mid or thoracic, lower or lumbar). Scoliosis is more common in females than males and must not be confused with poor posture. There are three different types of scoliosis that can occur in children. In most of the cases (around 80%) the cause of scoliosis is unknown and it is called Idiopathic Scoliosis. This types of scoliosis can be infantile, Juvenile and Adolescent (in children between age 10 to 18). This is the most common kind of scoliosis. Congenital Scoliosis. It occurs in womb during the development of the foetus. Neuromuscular Scoliosis. This types of scoliosis is always associated with other neurological conditions that may affect children such as Cerebral Palsy, Muscular Dystrophy, Spina Bifida. The standard screening test is called “Adam’s forward bend test”. The child bends forward with feet together, knees straight and arms hanging free while the doctor observes him from the back. Apart from a physical examination, the primary diagnostic tool for scoliosis is X-ray, but other diagnostic procedures may be performed such as Magnetic resonance imaging and Computed Tomography (CT) scan. An early detection is fundamental for a successful treatment. Always exclude a LLD (Leg Length Discrepancy) that may show as a pseudo scoliosis. In general, if the spinal curve is less than 25 degrees or if the child is near the end of her growth, the doctor will just keep examining the patient every 6 to 12 months. 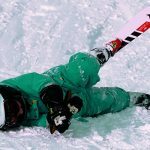 If the spinal curve is greater than 45-50 degrees and bracing wasn’t successful surgical treatment may be suggested. In any case it must be said that treating scoliosis must be done with a personalized approach. Scoliosis requires careful and frequent examinations. If left untreated it can worsen and cause other problems that may affect heart and lung functions. 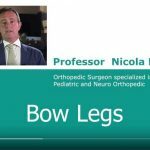 Prof. Portinaro has been treating Scoliosis for more than 30 years following the most evidence-based treatment. If the scoliosis is dynamic and reducible treatment has been focused on postural global rehabilitation giving in general good results.